I sent the kids to school last Tuesday and if I am being perfectly honest with you, it was not the smoothest transition. Every year I forget just how exhausting the first few weeks of school can be, for the kids and for me. Clay started kindergarten and is really having a hard time with how long the school day is. I have heard many times this week, “kindergarten is too long.” He is right, it is a long day for a 5 year old, but he will adjust. The big kids love their teachers and are happy to be back with their friends. I do love back to school, it holds the same promise of a new calendar year. We clean out closets, organize, set new routines. I love summer, but look forward to the structure of the school year. We made it through the first week and had a really nice weekend. We went apple picking and had dinner with friends that we have not seen in years. Today we slept late, ate apple cider doughnuts from the apple orchard, and watched football. Now that school is back in session, I am spending a lot more time in the kitchen. It feels good. I really do love cooking, but sometimes the day-to-day grind of feeding a family 0f 5 can be a lot. I am trying to get the kids to eat a more varied diet, and it is not easy to get them to adopt new foods no matter how hard I try. Smoothies have been a good gateway for new fruits and healthy fats. I can slip an avocado or some flax seed into a smoothie and they are none the wiser, until I tell them after the fact. They are more willing to drink a new fruit than eat it plain. It’s a start, and for that, I am happy. Lately, my favorite treat has been a creamsicle smoothie. I absolutely love the orange/vanilla combo and this smoothie tastes like the ones that I used to buy at the mall when I was a kid. I get a lot of questions about why I add coconut oil to my smoothies, first, I love the way it tastes. I love coconut anything. Coconut oil has many healthy benefits – is a healthy fat, and helps regulate blood sugar. I cook with it a lot, and it has become a staple in my kitchen. Make sure to buy extra virgin and centrifuged coconut oil. It is really good on popcorn with sea salt. My kids have been loving that as a snack lately. Start by segmenting the oranges. 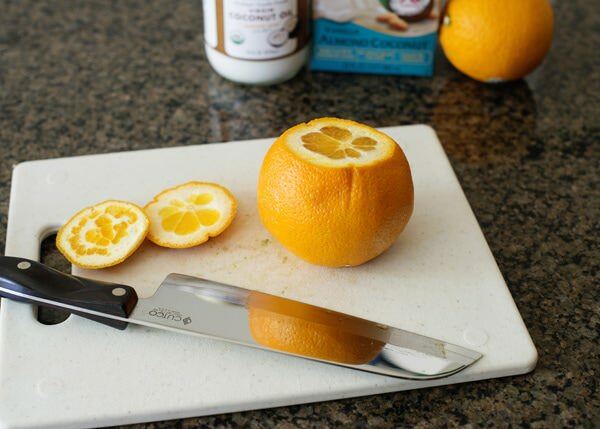 Slice the top and bottom off of the orange. 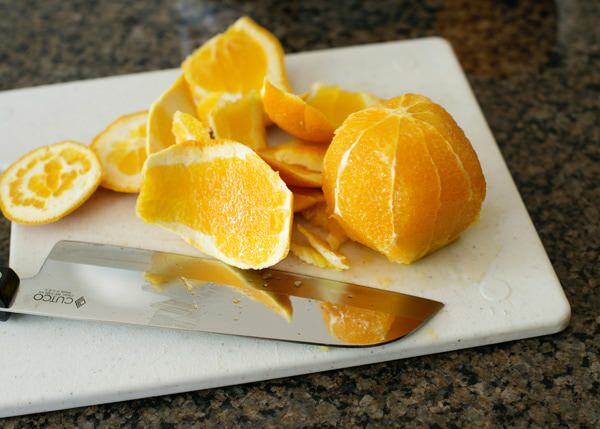 Take your knife and starting at the top slice off the pith and peel. Go all the way around until all of the peel is gone. Cut in between the membranes to get the flesh out. 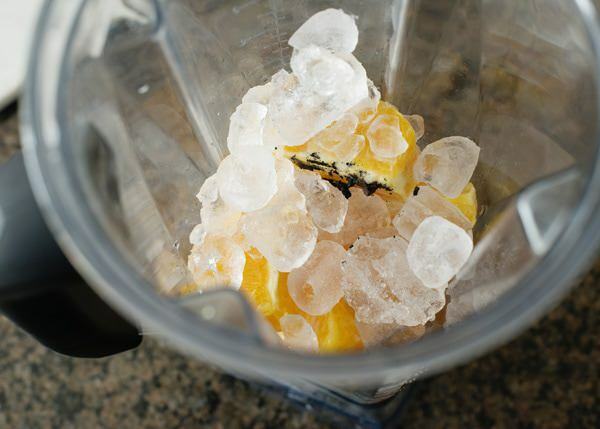 Add the orange pieces and vanilla bean to a blender. Add almond milk and ice. 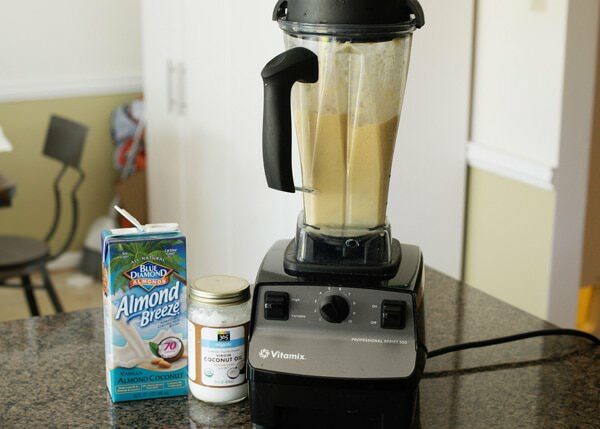 Add a teaspoon of coconut oil to the blender. Start by segmenting the oranges. Slice the top and bottom off of the orange. Take your knife and starting at the top slice off the pith and peel. Go all the way around until all of the peel is gone. Cut in between the membranes to get the flesh out. 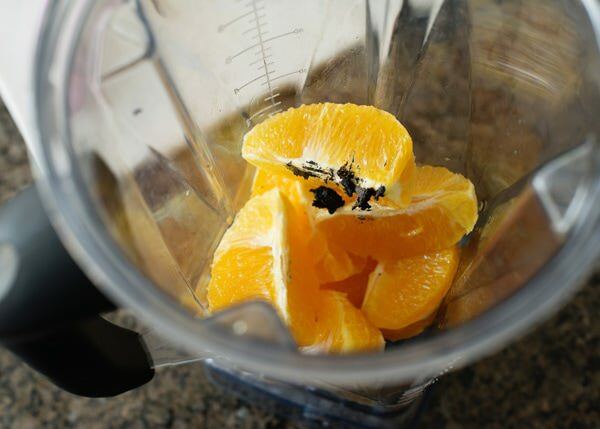 Add the orange pieces and vanilla bean to a blender. Add almond milk and ice. Blend until smooth. 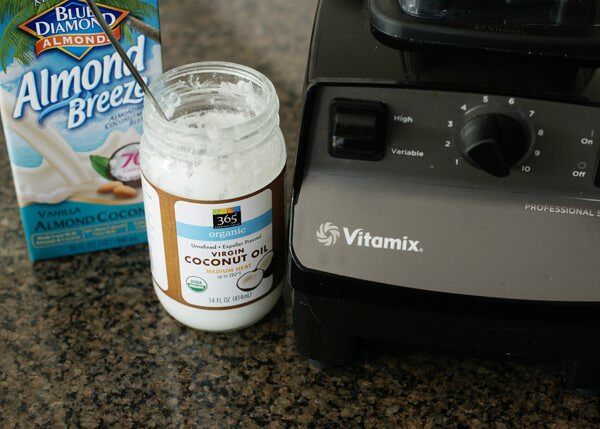 Add a teaspoon of coconut oil to the blender. Pour into a glass and enjoy! Disclosure: I am being paid by Blue Diamond Almond Breeze for this post. I am compensated for my time, however all opinions expressed are my own. 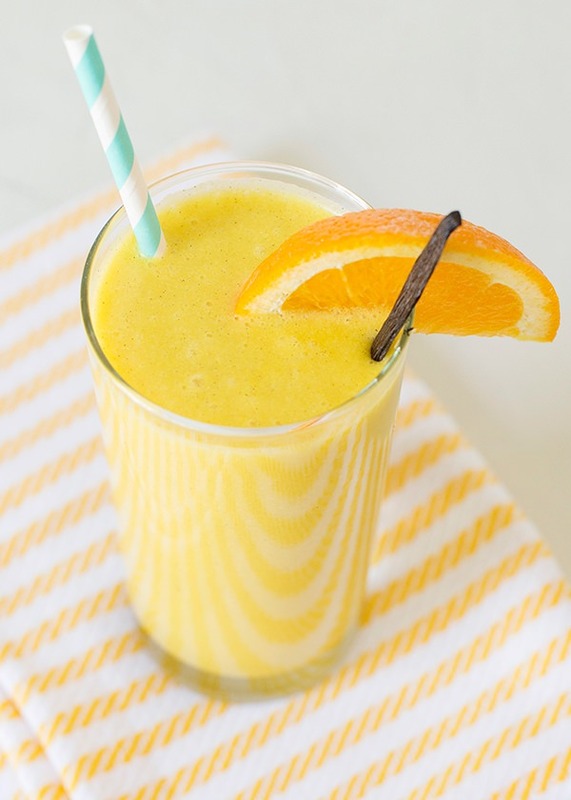 These smoothies sound like the perfect treat! Love it! Sort of like a healthy milkshake! thank you! And thanks for the pin! Creamsicle has got to be my favorite. Love this healthier version! Me too! Love ANYTHING with orange and vanilla. Your kids are so cute! So happy they are liking school (for the most part!)! 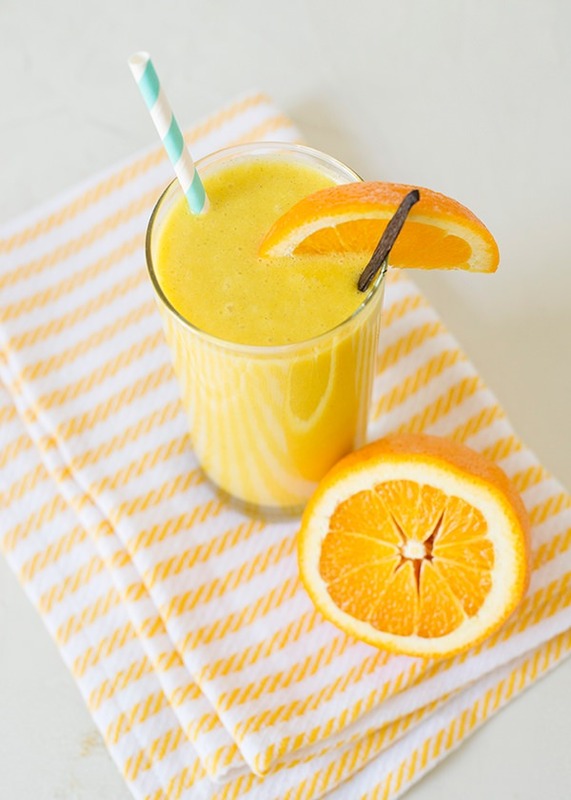 These smoothies look great and like they would be the perfect after school snack! YUM! either is fine. I usually just throw a glob into the blender, I never measure. My son started kindergarten too. He is so tired by the end of the day, but has so much fun! This smoothie looks great. 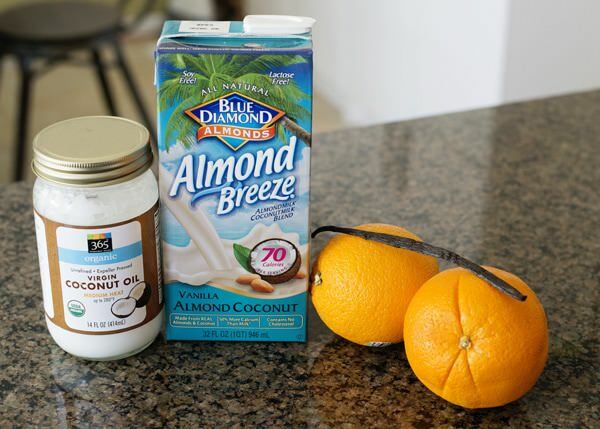 I love the addition of the coconut oil! He is starting to like it more. And not quite as tired. I hope that it is getting better for your little guy too. What lucky kiddos! Putting this smoothie on my to-do list this weekend! Looks seriously yummy. Just made this and it was great. I added a little raw honey and had it as a dessert! One question…My coconut oil kind of “globbed” up into little balls, rather than blend smoothly into everything. Did I just not blend long enough? Or are you not supposed to blend it at all? You need to add the coconut oil at the very last second. Otherwise it gets cold and clumps.